Drifts of daffodils, snowdrops and crocus in open grass are one of the classic signs of spring. Although they look like the work of nature, they are simple to create and will last for many years. Naturalising bulbs is a great way to brighten up lawns, verges and wildflower areas in spring. In areas of grass, choose bulbs that complete their growing and flowering early, such as crocus. Most daffodils also do well in grass, but leave at least six weeks after flowering before mowing, and ideally leave until foliage goes yellow and straw-like. Naturalised bulbs can also give interest to areas of the garden that otherwise might not bloom. Under deciduous trees, where the conditions are too dry and shady for most plants, you can use spring- or autumn-flowering bulbs because they are in growth when the trees have few leaves to cast shade. Suitable choices include anemones, crocuses, scillas and hardy cyclamen, such as C. hederifolium and C. coum. Most of the larger trumpet and large cupped daffodil hybrids will naturalise well. Spring-flowering bulbs should be planted in autumn. This will ensure that, if you are planting into turf, it quickly re-roots rather than dying back in dry or frosty weather. Summer-flowering bulbs can be planted in autumn if they are hardy (Camassia, for example), or in spring if they are more tender, such as Gladiolus communis subsp. byzantinus. When planting bulbs for naturalising, scatter them randomly over the chosen area and plant them where they fall. As these bulbs will be in place for several years, check that the bulbs are not very close to each other as overcrowding will reduce flowering. 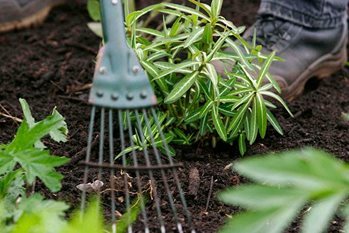 Dig planting holes with a trowel or, in grassed areas, use a bulb planter. The holes need to be about three times the depth of the bulb, as shallow planting tends to weaken the bulbs because they are more prone to drying out. Break up some of the soil from the plug of turf removed with the bulb planter, and use this to backfill around the bulb once it is in the hole. Replace the turf on the top of the hole. Aim to make the top of the turf plug level with the surrounding lawn surface. When planting small bulbs, such as crocuses, in areas of grass, lift or roll back sections of turf. Fork over the soil and add a little balanced fertiliser, such as Growmore. If possible, score the underside of the turf with a hand fork to loosen the soil before replacing it. Firm the turf by hand or by gently tamping with the back of a rake. There aren’t many problems to watch out for, apart from checking that the bulbs are healthy to start with (discarding any that are soft or show signs of rot). However, the following can be troublesome at times: slugs, snails, squirrels (particularly with tulips and crocus), daffodil viruses, tulip viruses, snowdrop grey mould and narcissus basal rot.